The annexin superfamily is composed of 12 members in humans, characterized by the unique Ca2+-binding-site architecture, which enables them to peripherally attach to negatively charged membrane surfaces. 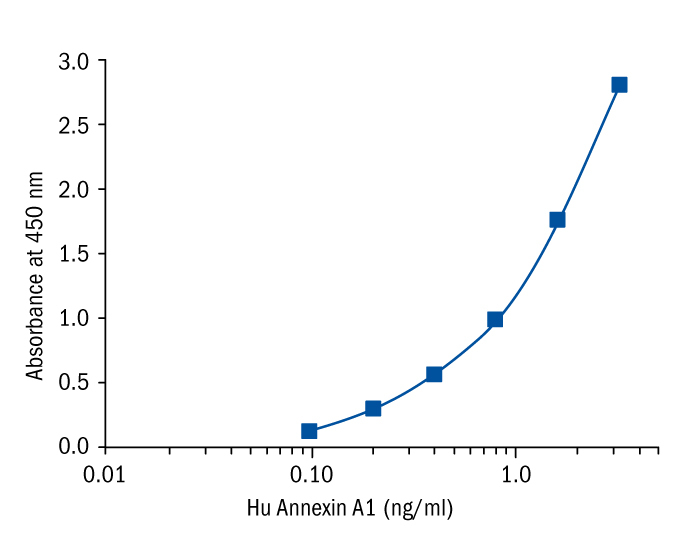 Annexin A1 (AnxA1), also known as annexin I or lipocortin I, was characterized as a glucocorticoid-regulated anti-inflammatory protein. This 37-kDa protein is comprised of a homologous core region of 310 amino acid residues, representing almost 90% of the structure, attached to a unique N-terminal region. AnxA1 is a Ca2+-regulated phospholipid-binding protein. To mediate membrane binding, Ca2+ ions can induce a conformational change that leads to the exposure of the bioactive N-terminal domain. The different functions of AnxA1 lie within the unique N-terminus. AnxA1 is expressed in several tissues and involved in different cell processes including cell survival, proliferation, apoptosis, differentiation and migration. AnxA1 can be nuclear, cytoplasmic and/or membrane-associated. Depending on the human tissue/cell line, AnxA1 can be cleaved at different positions by different proteases. The membrane-associated AnxA1 can be proteolytically cleaved to become accessible to its cognate partners, the formyl-peptide receptors (FPRs). The AnxA1/FPR complex has been found to be involved in inflammation, neuroendocrine system regulation, skeletal muscle differentiation and cancer progression. To date, FPRs are the only known receptors of externalized AnxA1. As these receptors can be activated or silenced by a variety of synthetic ligands, they represent an attractive family of pharmacological targets. AnxA1 is able to counterregulate inflammatory events. AnxA1 and its mimetic peptides inhibit neutrophil tissue accumulation by reducing leukocyte infiltration and activating neutrophil apoptosis. Some evidence has suggested the ability of AnxA1 to induce macrophage reprogramming towards a resolving phenotype, resulting in reduced production of proinflammatory cytokines and increased release of immunosuppressive and proresolving molecules. Thus, AnxA1 could be a promising tool for development of new therapeutic strategies for treating inflammatory diseases. Deregulation of AnxA1 often correlates with cancer, and its role in tumour initiation, proliferation and metastases has been established. AnxA1 could be a tumorigenic mediator between cancer cells and their microenvironment. Efficient inhibitors of AnxA1 could potentiate cell response to chemotherapy. The overexpression of AnxA1 in the cytoplasm of tumour cells has been observed in several cancers. AnxA1 is specifically expressed in tumour vasculature (at least in breast, kidney, liver, lung, brain and prostate cancers) and could be a promising target for human tumour imaging, drug delivery and internal radiotherapy. In some cancers, AnxA1 is found at the cell surface, where it stimulates FPRs to trigger oncogenic pathways.